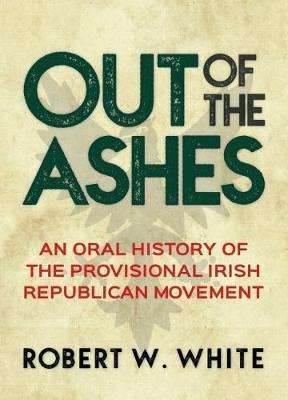 Out of the Ashes is the definitive history of the Provisional Irish Republican movement, from its formation at the outset of the modern Troubles up to and after its official disarmament in 2005. Robert White, a prolific observer of IRA and Sinn Féin activities, has amassed an incomparable body of interview material from leading members over a thirty-year period. In this defining study, the interviewees provide extraordinary insights into the complex motivations that provoked their support for armed struggle, their eventual reform, and the mind-set of today's 'dissident' who refuse to lay down their arms. Those interviewed stem from every stage of the Provisionals' history, from founding figures such as Seán Mac Stiofáin, Ruairí Ó Brádaigh and Joe Cahill to the new generation that replaced them: Martin McGuinness, Danny Morrison, and Brendan Hughes among others. Out of the Ashes is a pioneering history that breaks new ground in defining how the Provisionals operated, caused worldwide condemnation, and were transformed by constitutional politics.